Success in the NFL as a player is usually predicated on how talented or hard-working you are. Others times, the organization that drafts you can also play a huge role in how a career turns out. Organizations with dysfunctional culture can chew player after player up, taking a guy who was once special and leaving him a shell of himself. LaVar Arrington believes the Redskins have ruined Robert Griffin III, so much so that he believes a change of profession is his only shot at success. “A different profession, probably,” he said. “For me, I look at it like this: Once you’ve damaged somebody the way he’s damaged right now, I just think that it will be a long shot for him to turn out to be what he was and what people expected and anticipated him to be. When he was drafted, his rookie year, they ran a lot of Wildcat and that read-option did very well. 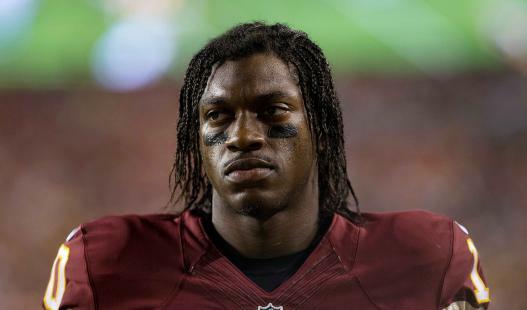 And if you notice, it’s not just Robert Griffin III that’s struggling. It’s guys like [Colin] Kaepernick as well. Arrington said some of the blame for Griffin’s failings fall on the coaching staff.